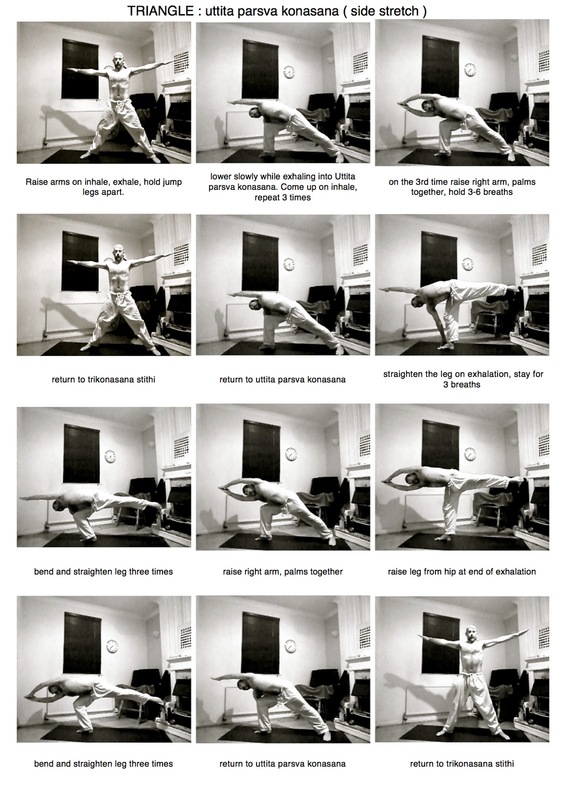 This is another subroutine that I decided to re shoot and make up another sheet from that on my Vinyasa Krama Sequences and subroutines website. The main difference is that here I include the intermediate stage of keeping the palm on the mat while bending and straightening the knee. This is a particularly challenging subroutine and the intermediate stage may be plenty to be going on with for a while. The important thing is to work on the balance and breathing, only moving on when the breath allows us to do so. The first two weeks of Ramaswami's Teacher Training course had seemed relatively easy. We'd spent a lot of time with the On your feet sequence focusing on principles and guidelines as well as some Asymmetric and Seated postures. The 4th of July holiday was coming up and we had a couple of days off, a few of us came up with the idea of practicing the complete Vinyasa Krama syllabus, one sequence after another, we figured it would take around five hours. Perhaps Ramaswami got to hear about it but the next sequence we began to study was the triangle sequence, watch the video, Ramaswami had us do this particular subroutine at about half the speed ( at least it felt that way ), long slow inhalations and exhalation as we would raise and lower on one leg. The next sequence we explored was the On one leg sequence, more long slow one legged squats. The plan to practice the whole syllabus in one go quickly dissolved. Ramaswami referred to the On one leg postures and subroutines as tapas. In Sanskrit tapas means heat and these postures certainly heat you up, used figuratively tapas can denote spiritual suffering, mortification or austerity, which comes closer to the experience of a one legged squat. Tips and hints to make this subroutine a little easier or at least more manageable. I use a geyser coming up out of the ground and up through my leg which seems to help to keep it strong ( old Aikido trick). As I lower I'm lowering down into the geyser which keeps me strong and supported. Whatever you use the mind needs to be completely focused. Think tapas, you get to ask the gods for a boon (favour) after this. These are tough but they strengthen the legs, above and below the knees which will protect them in the long term. Strong legs help in the standing backbends. Don't go down too low at first. Lowering is easier than coming back up. If necessary lower slowly but then put your hand and foot back down to come back up before raising your arm and leg and lowering again until your legs strengthen enough to come back up unsupported. Is there a new video for side stretching routine? Oops, posted the wrong video, well spotter Sharon, thanks for pointing it out, All fixed now. Never miss a day! Thanks!